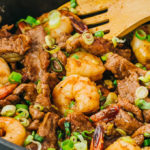 Asian surf and turf: an easy stir fry recipe with steak and shrimp, cooked with a savory sauce and served with low carb cauliflower rice. If moist, pat steak dry using paper towels. Thinly slice into 1/4 inch thick strips, and toss them in a large bowl with corn starch until well coated. Set aside. Peel and remove veins from the shrimp. If moist, pat them dry with paper towels. Set aside. In a small saucepan, add all sauce ingredients. Occasionally stir as you bring to a simmer over medium-low heat, about 5 minutes. Once it starts to simmer, reduce to low heat to keep the sauce warm while you cook the steak and shrimp. In a large wide pan, heat vegetable oil over medium heat for a few minutes or until hot. Add sliced beef to the hot pan and cook until mostly browned, a few minutes, stirring frequently. Transfer to a plate and set aside. Add shrimp to the pan in a single layer. Cook until they start to become pink around the edges, and then flip them. Cook for another minute or until cooked through. Return the beef to the pan and pour the sauce on top. Stir for a minute to let the beef and shrimp soak up the sauce. Turn off the heat. Stir in scallions and serve immediately, optionally pairing with cooked cauliflower rice. This recipe yields 10 g net carbs per serving (half of the recipe). Nutrition info doesn't include optional serving ingredients.